mediSOS . :: The festival of colours is here. Some tips For You! ::. Home > Blog > The festival of colours is here. Some tips For You! · Massage your hair well from scalp to hair tips with coconut, olive or castor oil. This oil gives your hair a protective covering and shields it from harmful chemicals, dust and dirt. This will help the colours come off easily later. · Try and cover your hair with a bandana or cap to decrease contact with colours. · After the celebrations, rinse hair with plain water to rid it of dry colours and other particles. Apply a mild shampoo followed by a good conditioner. · You can also apply a hair pack made of fenugreek seeds, amlapowder, boiled shikakai powder and water. · Another homemade recipe that works is a mixture of henna powder, four teaspoons of lemon juice and curd. Apply on hair and wash after an hour. · Wear clothes that cover a lot of your skin. · Cover the skin on your face, arms, legs etc with copious amounts of olive oil, coconut oil, almond oil or mustard oil. · Use a waterproof sunscreen (SPF 30 and above). · Cover your lips with a thick coat of Vaseline or lip balm. · Protect your nails from the colours by using transparent nail polish. If you have long nails, you can use it on the underside of the nails as well (remove this after the celebrations). · Remember not to use harsh soaps to get rid of colours from your skin. · Mix one spoon of masoor dal, one spoon of flour, 1 spoon of rose water and a pinch of turmeric. Apply the pack on your skin and let it dry for 20 minutes. Scrub off initially with and then wash with water. · Mix a paste of soya bean flour or besan with milk. Add some sea salt, glycerine and a few drops of aroma oil. Use a moisturizing soap to wash off the colours. Use a cream cleanser or baby oil to massage off the remaining colour. · Wash your face with warm water and then with the help of cotton apply aloe vera and lemon. This solution helps in getting rid of dry colours. · Never rigorously rub your face while trying to get rid of colours. This will make your skin itchy and dry. Instead dab some coconut oil and then try to remove the colours. · If you are a known asthmatic or suffer from severe dust allergy, it is advisable not to venture out to play Holi with colours, especially the dry variety. · If you wear contact lenses, do remove them before going out to play holi. If someone is spraying coloured water on your face, close your eyes. · Bhang, the official drink for Holi, when consumed in large quantities can lead to effects like increased blood pressure and heart rate, psychosis. Never consume it on an empty stomach and do not mix it with alcohol. 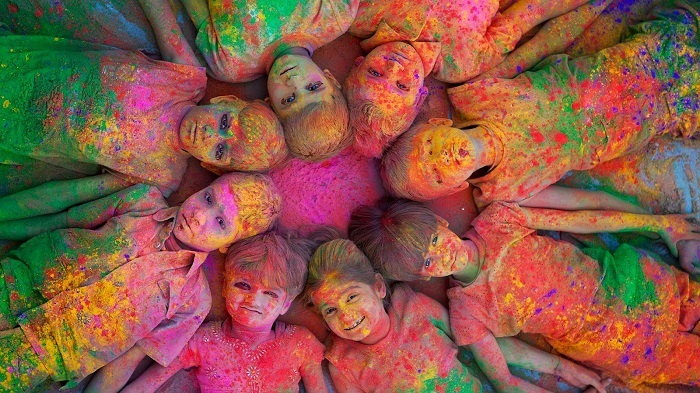 We wish you a happy and prosporous holi!